The Washington Post reports that there is a $23 billion racial fund gap between white school districts and nonwhite school districts, which should not surprise anyone especially if you have seen our new video Redlined, a Legacy of Housing Discrimination (follow link below). After all, segregated neighborhoods results in poorer segregated schools. California’s high-speed rail project has repeatedly hit lawsuits, engineering problems, geological obstacles, bureaucracy, swelling costs and delays. Its budget has ballooned from $33 billion to $77 billion, with no secure financing plan. Yesterday, my colleagues Thomas Fuller, Jennifer Medina and Conor Dougherty took a hard look at the future of America’s infrastructure projects, like California’s high-speed rail. More specifically: Are projects that big even possible anymore, given the cost and regulation? In California, that regulation has reached notoriously byzantine heights and is epitomized in four letters: C.E.Q.A. California Community Builders has just produced a short historical documentary that demystifies the lasting impact of government policies that communities of color have endured. The video not only delves into some of the psycho-social remnants of blatant discrimination of people of color but also into what it has done to the White community. 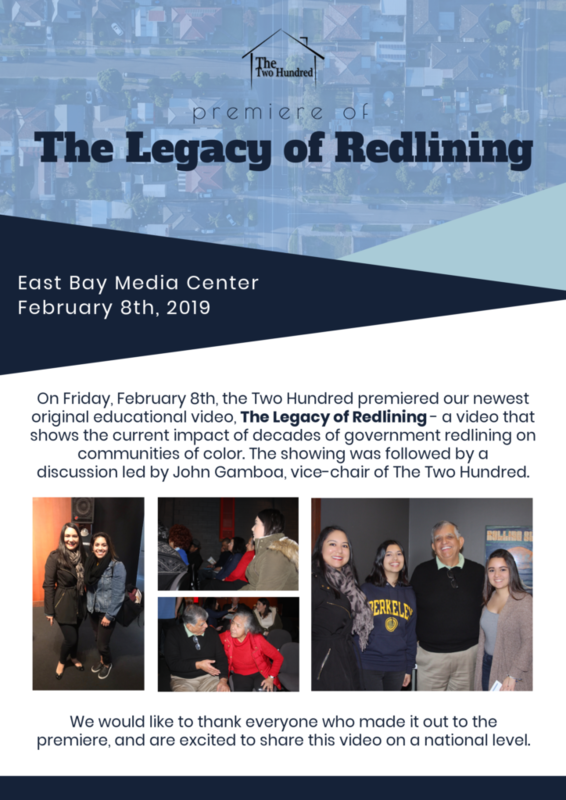 Follow and click the link below to view the video – Redlined, A Legacy Of Housing Discrimination. It also spawned what was called “redevelopment,” a tool that would, it was said, clean up inner-city slums and help their residents enjoy the nation’s ever-expanding prosperity. Who Will Pay The Cost To Be Green? For a proposal that’s only been on the national agenda for a few months, pushed largely by first-time Congresswoman Alexandria Ocasio-Cortez and youth activists associated with the Sunrise Movement, these polling numbers show that Americans are certainly not opposed to climate action, but want it to be done in a way that doesn’t place the burden of the transition on the poor and those struggling to get by. It must lift everyone up and build a better society. A Green New Deal could ttract significant support for the next Democratic presidential nominee should they come from the left-wing of the party and be prepared to push an ambitious agenda. There’s been a lot of discussion about the specifics of the plan, and the resolution released by Ocasio-Cortez and Senator Ed Markey today outlined their vision for the transformative proposal. One of the core elements is a job guarantee, which would ensure that every American who wants a job can have one, meaning there needs to be work for them to do to expand sustainable industries and build the infrastructure to bring the United States into the twenty-first century. Similar to how President Franklin D. Roosevelt’s New Deal invested in roads, bridges, airports, helped build the suburbs, and set the stage for the dominance of the automobile — an agenda further advanced by the presidents that followed and the building of the Interstate highway system — a Green New Deal could be used to reorient cities around people instead of cars with a sustainable transportation system that expands public transit, builds out cycling infrastructure, and adds a proper high-speed rail network. These initiatives would provide investment to renew cities and towns in the Midwest and South, while creating jobs for those who feel left behind. In the face of crumbling infrastructure and communities that have been so long ignored that they look more like developing countries than the thriving cities on the coasts, a Green New Deal is exactly what the country needs. Far too often, a car is necessary to get anywhere even in the largest American cities. Transit, if it exists at all, is infrequent and slow, making the trip far longer than it would have been in a car. For decades, we’ve accepted this tradeoff, and many people still believe that transit is inherently bad: a last resort for those who can’t afford a car. But nothing could be more wrong. If the buses are terrible in your city, you may think that buses are terrible in general. In truth, a city’s bus service is as good as its leaders and voters want it to be. Where voters have funded better bus services and cities have worked to give them priority, as in Seattle, ridership has soared. The only thing stopping cities and towns across the United States from having world-class transit systems is political will — and a Green New Deal could provide the push (and the funding) to finally make local governments recognize that the automobile isn’t the only way for people to get around. The idea that the United States can’t take on major projects reflects a defeatist mindset poisoned by the neoliberal notions of infrastructure privatization, limited government, and overreliance on the market. Across the United States, governments are already putting more money into transportation projects with the support of voters. In 2017 and 2018, voters approved 90 percent and 85 percent of transportation ballot measures across the country to invest in buses, light rail, and other public transit initiatives; California is pushing forward with its high-speed rail line to connect the state’s major cities despite right-wing opposition. But even with these positive stories, the country needs to accelerate the shift. China provides an example of how quickly transportation projects can be built and what a really commitment to mass transit looks like. The United States may not be able to build as fast as the Chinese because of different regulatory and property-right systems, but they could build much faster than they are at present with dedicated funding and a national vision for the future of mobility. In 1990, China had hardly any metro systems, but it now has more than 3,100 miles (5,000 km) of metro lines — more than four times the metro lines in the United States — and there’s about another 600 miles (1,000 km) of bus rapid transit lines. This has been possible because the Chinese government spent $189 billion on metro lines between 2010 and 2015, and is expected to spend as much as $308 billion more between 2016 and 2020. Meanwhile, the U.S. government dedicates a mere $2.3 billion per year for transit projects. But that’s not the only area where the United States has fallen far behind. Voters in California approved the state’s high-speed rail project in 2008; the same year that China opened its first line between Beijing and Tianjin. Since then, China’s high-speed-rail network has grown to over 13,670 miles (22,000 km) at a cost of about $360 billion, with another 9,320 miles (15,000 km) expected to be complete by 2025. The first segment of California’s 800-mile (1,280-km) project is set to open in 2027. The rapid expansion of metro systems and high-speed rail across China may seem too fast to be replicated in the United States, but that reflects a defeatist mindset poisoned by the neoliberal notions of infrastructure privatization, limited government, and overreliance on the market. The truth is that the United States has undertaken massive infrastructure projects in the past, as noted earlier in this piece, and the Interstate highway system provides the best example of what a Green New Deal could set out to achieve if that ambition can be recovered to drive a new program of investment. President Dwight D. Eisenhower authorized the building of the Interstate in 1956, and within ten years more than 15,000 miles (24,000 km) had already been built — similar to what the Chinese have achieved with high-speed rail over a comparable period. The Interstate now stands at over 47,000 miles (76,000 km) and cost about $500 billion. The investment has been estimated to have produced $6 in economic benefit for every $1 spent, and there’s no reason to believe that a similar program aimed to build out the transportation infrastructure of the twenty-first century wouldn’t have a similar outcome. The Interstate provides a concrete example of what the United States can achieve when it has the political will to embrace big ideas and throw off the shackles of a misguided believe in “small government,” but its promotion of automobility is not suitable for the modern world where people are heading back to cities, want to live in walkable communities, and urbanization rates are growing the world over. The city of the future is not one where human-driven cars are swapped out for those driven by artificial intelligence as Silicon Valley thought leaders have been pushing for the past few years, but rather urban centers which go back to basics with investments in transit, cycling, and walkability — the mobility choices that move people much more efficiently in densely-packed cities. New York City’s subway system used to lead the world; now it’s the leading example of what happens when transit is underfunded for decades by governments that have been starved of revenue and have slowly privatize their responsibilities. A Green New Deal should focus not just on updating the systems for the future, but expanding it even further. The Interstate is estimated to have produced $6 in economic benefit for every $1 spent. The Green New Deal could produce similarly beneficial returns. And it’s not just major cities like New York City, Chicago, or Los Angeles that should benefit. Cities and towns across the United States need reliable transit options and networks of protected bike lanes that work for their size and layout — that could include bus lanes, bus rapid transit, light rail, and even new metro systems where the population is there to support them — or where they’re to be added. After nearly a century of auto-oriented development, transit may not always seem immediately workable in many urban areas across the country — but cities didn’t always have sprawling suburbs either. At a time when cities across the country are struggling to provide affordable housing for their residents, a Green New Deal could revive the government’s role in providing social housing to both increase the housing stock and provide an alternative to the private market. The overreliance on private developers over the past several decades has been a policy failure — and it’s time for that to change. Density has to increase around transit, both existing and planned, and Ocasio-Cortez and her allies should look to Vienna and Singapore for alternative models of social housing where it isn’t simply a last resort for the poorest residents, but provides stable housing for people across many income brackets. And in denser cities, in contrast to suburbs populated by single-family homes, communities with government-owned and resident-managed housing stock would be a better model to ensure equity and affordability. Freedom, after all, is not about rich people paying low taxes, but about everyone being able to live a good life, have a nice place to call home, and move through their cities and their lives with as few barriers as possible. Finally, cities and towns also need to be connected, and if car ownership is to be reduced and short-haul air travel curtailed, there will need to be mass investment in the rail network in a similar vein to China. Just as the U.S. government made a massive investment in the highway system in the middle of the twentieth century, it now needs to build out a high-speed rail network to rival those of countries in Asia and Europe that will make it quicker and easier to move between the major metros while reducing the number of people who take short flights. After decades of politicians being constrained by a neoliberal ethos of cutting taxes and making minor reforms to the status quo, Ocasio-Cortez, Markey, and the Sunrise Movement have given us a rare opportunity to revive the political will for visionary action to remake our society around goals of liveability, equity, and freedom — because freedom, after all, is not about rich people paying low taxes, but about everyone being able to live a good life, have a nice place to call home, and move through their cities and their lives with as few barriers as possible. That’s not what we prioritize right now, but an initiative like the Green New Deal could go a long way to pushing us in that direction.